Les Paul is more than just the name of Gibson's most famous guitar. He is an innovator, pure and simple. And a true innovator always goes down as legend. 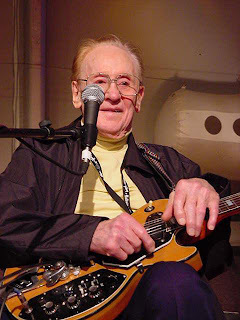 Les Paul understood the guitar inside out, including all the physics involved, like how much energy is used by a vibrating string, or how powerful the sound will be depending on the type of wood. And all that jazz. He is also an innovator in recording techniques, credited as the pioneer of overdubbing, delay, phasing, and multitrack recording. Honestly, I was never really familiar about Les Paul the person. Although I am familiar with Les Paul the guitar. And like I said, Les Paul is now legend, and the person and the music have become one. And the other musicians who have left this earth are now playing with him non-stop in that big jam session in the sky. Les Paul a.k.a. Lester William Polsfuss. 1915-2009.